It may seem like there’s a never-ending list of questions your marketing needs to address. But when you boil them down, there are really only three. 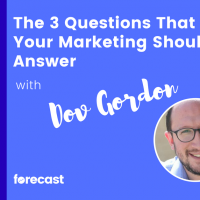 In this episode, Dov Gordon breaks down each of the 3 questions and shares how to answer each one effectively.